12" 13" 14" 15" 16" 17" 18" 19" 20" 21" 22" 23" 24" 25" 26" 27" 28" 29" 30" 31" 32" 33" 34" 35" 36" 37" 38" 39" 40" 41" 42" 43" 44" 45" 46" 47" 48" 49" 50" 51" 52" 53" 54" 55" 56" 57" 58" 59" 60" 61" 62" 63" 64" 65" 66" 67" 68" 69" 70" 71" 72" 73" 74" 75" 76" 77" 78" 79" 80" 81" 82" 83" 84" 85" 86" 87" 88" 89" 90" 91" 92" 93" 94" 95" 96" 97" 98" 99" 100" 101" 102" 103" 104" 105" 106" 107" 108" 109" 110" 111" 112" 113" 114" 115" 116" 117" 118" 119" 120" 0/0"1/8"1/4"3/8"1/2"5/8"3/4"7/8"
Bamboo shades or woven wood shades as they are also known, add elegance to any window you may want to cover. The bamboo materials used to manufacture our woven wood shades have unique color variations and textures to add beauty to every window. The natural look of all of these woven wood blinds are unique and incredibly popular. Bamboo window blinds will turn your home into a instant retreat, allowing you to enjoy the relaxing feel of the outdoors without leaving the walls of your home. With bamboo shades not looking exactly alike, you will receive a gorgeous unique product adding value to any space they are placed. All of our bamboo woven wood shades are made from high quality, renewable natural materials. Meaning you can know with the purchase of your woven wood roman shades are supporting a sustainable and renewable future. However, there are different colors, textures and patterns available. You will also find upgrades as well. Simply choose the color and pattern of the bamboo shades that you like best! So you can be assured your bamboo blinds will fit your style and taste. Many of the interior designers that we work with use bamboo shades often since they are incredibly popular, versatile and work with many different types of decors and paint colors. Interior designers also find them to work with all kinds of architectural designs including offices, and homes. 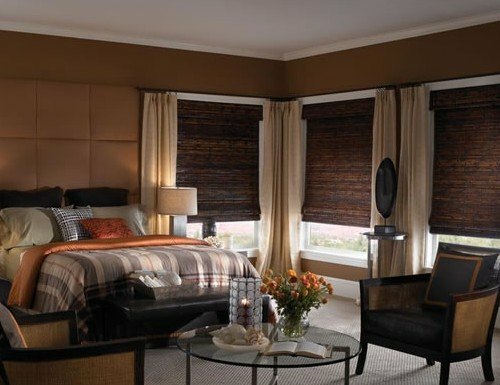 Bamboo roman shades offer that elegant but simple look. If you've been searching for bamboo window shades that boast an air of understated sophistication and can work to either enhance or downplay your room, look no further than the versatile and environmentally friendly bamboo shade. Bamboo shade window treatments work wonderfully in rooms where both privacy and light control is needed. The roman folds are gently woven together in a beautiful and timeless pattern that allows bits of light to seep in while blocking glare - without making a room pitch black. 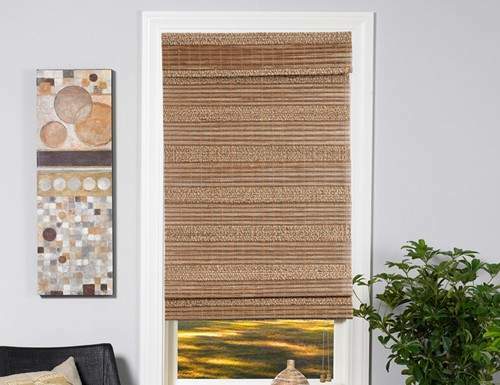 This woven shades design boasts a natural quality that will fit easily into any space, regardless of its preexisting decor. 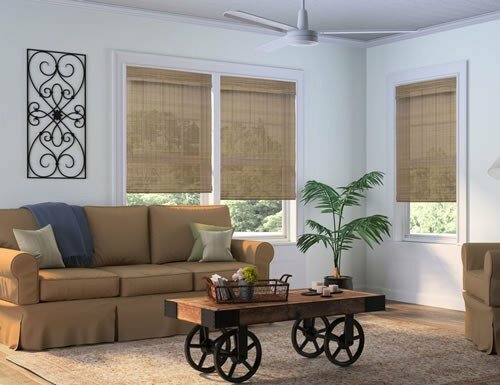 Homeowners can also rest assured knowing that these chemical and pesticide-free bamboo woven wood shades are safe and durable enough to bring into your home. Since our bamboo window shades come in a wide variety of colors everyone will be able to locate a color that fits seamlessly into his or her homes decor. Matching cords and tassels will work to complete the unified look, solidifying your look and design. 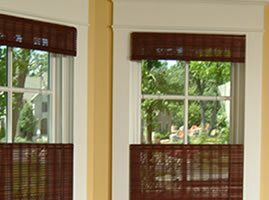 Privacy or blackout linings can also be added to a set in order to offer further protection from outside lighting, these shades are known as Privacy and Blackout Shades. Bamboo woven woods are wonderful options for bedrooms or even family rooms where you may be longing to watch a movie without the glare of the outdoors. Bamboo woven wood shades without the privacy lining are perfect for areas in your home where you want some protection from the outside world while still having the opportunity to enjoy the natural sunlight. 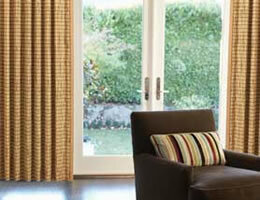 This is why woven blinds are ideal for any room they are placed in. The edge binding option is recommended as it protects the edges of the bamboo shade from splintering or breaking adding to there longevity. Edge bindings also add a touch of color to your woven wood shade making it unique. Several of the products we offer below have a “free edge binding” banner on them, meaning that you can enjoy this upgrade for free. This adds a personalized feel to your custom bamboo shades, that can be cut to fit any window. Our bamboo shades also come with different style options to further customize them including options such as cordless bamboo shades, for a blind safer for children and pets. But also different textures and looks. 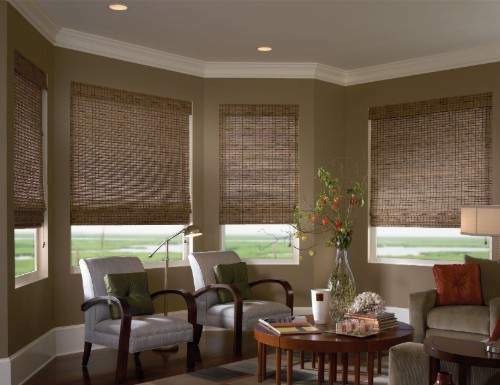 Bamboo woven wood shades are also incredibly easy to install and operate. Everything you need to install your new bamboo shade is included in it’s durable packaging except for a drill or screw driver. 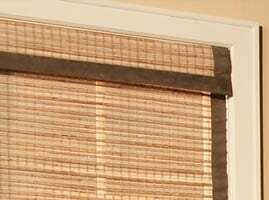 On each bamboo woven wood shades product page you will see a “how to Install” link underneath the products image. 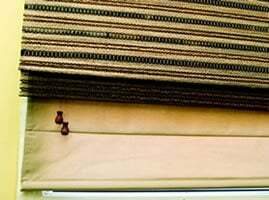 Clicking on that link will take you to it’s installation instructions for your new woven blinds! Free samples are available with all of our products including our discount bamboo window shades. 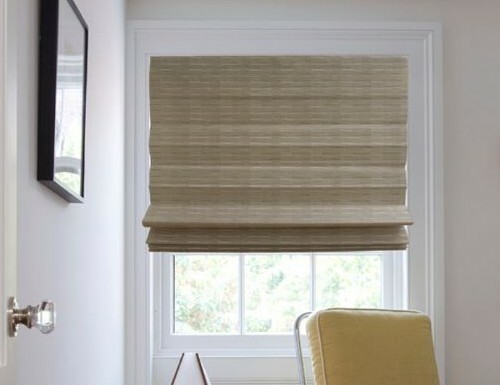 Take advantage of our free samples and order several different patterns, colors, and edge binding options to see what bamboo roller shades will work best with your home. If you have any questions about our bamboo woven wood shades please reach out to us by phone or live chat. One of our design consultants is standing by to help you with whatever you need. Note: Production lead times for woven wood shades are slightly longer than our other blinds and shades. We strongly recommend adding edge binding to any woven wood shade. Not only does edge binding add color and style to the shades, it protects the delicate edges of the bamboo from splintering, catching, or breaking. Edge binding comes in either varied fabric widths between 1 inch and 4 inches. See individual products for details. 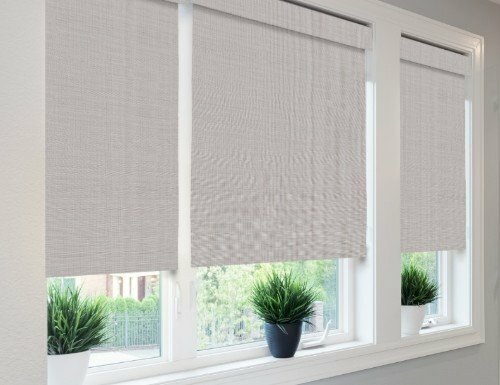 Since the fabric is wrapped around the edges of the woven wood shades, less than half of the fabric width is visible on the front of the shades. 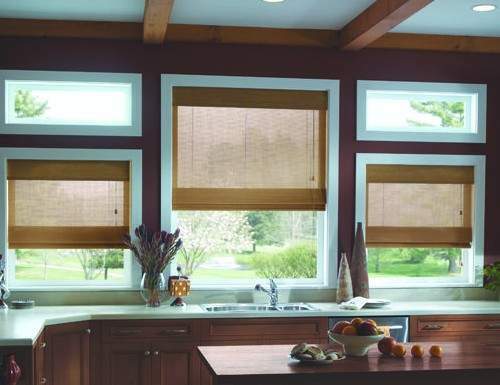 Because woven wood shades allow some light to enter through each of the woven bamboo fibers, adding a privacy or a blackout liner is recommended. This adds both privacy and light control to the bamboo shades. Liners can either be attached to the bamboo shade or movable liners with their own separate lift cord. Moveable liners can be raised during the day while the shade is lowered to allow filtered light in the room. The liners on our Tavarua Woven Wood Shades are made from a thicker fabric while our other woven wood shades offer a thinner polyester liner. Privacy Liners: Create privacy but allow some light to enter the room. 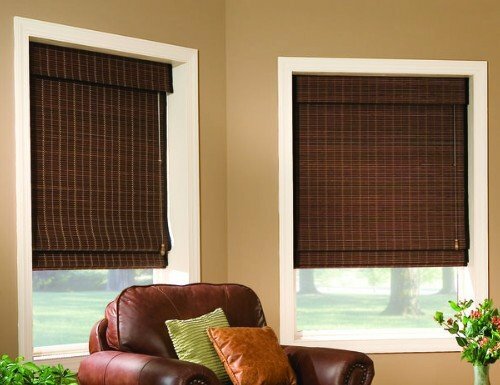 Blackout Liners: Block all light from passing through the shades as well as provide privacy. Minimal light may pass between the shade and the window frame. Moveable Roman Liner: Adds the ability to raise and lower the liner separately from the bamboo shade. Lift control will for the liner will be on the opposite side of the shades. The top down bottom up feature allows the bamboo shades to be raised as traditional shades but they may also be lowered from the top down. This allows light to enter the room and a view outside while providing more privacy than with the shades raised. Top down bottom up comes with 2 lift cords, one on each side of the shade. One to raise the shades and the other to lower them. When the shades are lowered from the top down the cords that suspend the shade will be visible. The rollease or continuous cord loop upgrade is a clutch mechanism and a continuous pull that makes it easier to lift larger shades.